With the release of the blockbuster movie “The Avengers” there has been a renewed focus on Jack Kirby and Marvel. It is not surprising that fans of Jack Kirby would continue to complain about how little he received for his part in the creation of the Marvel universe compared to how much the company benefited. The discussion has even made it into the more popular media. This is a good thing because you do not have to be a Kirby Cultists to believe an injustice has been done. And it is not just about the money. Yes the various movies have included mentioning Kirby but always towards the end of the closing credits. Open any Marvel comic today and you will only see credit for Kirby as a creator in Captain America (and that thanks to Joe’s Simon’s last legal battle with Marvel). While I am pleased that there is renewed attention to how Kirby was treated (and how his estate continues to be treated) I am always a little perplexed about some of the response. Perplexed but not surprised. Logically one might think that the opposite of the Kirby Cultists would be Lee Cultists but such is not the case. I do not think I have ever come across a fan of Stan Lee who was not a fan of Kirby as well. No the other extreme is occupied by comic book fans with rather puzzling motivations. I never truly understood their position because none of them seem to be able to provide an explanation that is remotely logical. For example take the recent posting by Scott Kurtz (Where Credit is Due). I will not provide a rebuttal of Kurtz’s arguments. One valiant attempt to refute Kurtz has appeared (Scott Kurtz is still Scott Kurtz) but I think even that writer would agree that he did not cover all of Kurtz’s points. Not because of the soundness of Kurtz’s arguments but rather of the over abundance of inaccurate, inconsistent and illogical claims. I have no idea were the vitriol from Kurtz and the ilk comes from but it certainly is not supported by their writings. Which leaves me to believe that their anger comes from some other source that they either do not recognize or want to publicly acknowledge. Harvey released a new title, Alarming Tales, with a cover date of September 1957. This is the same month that Black Cat Mystic #59 was released. Both titles covered the same genre, horror and science fiction. 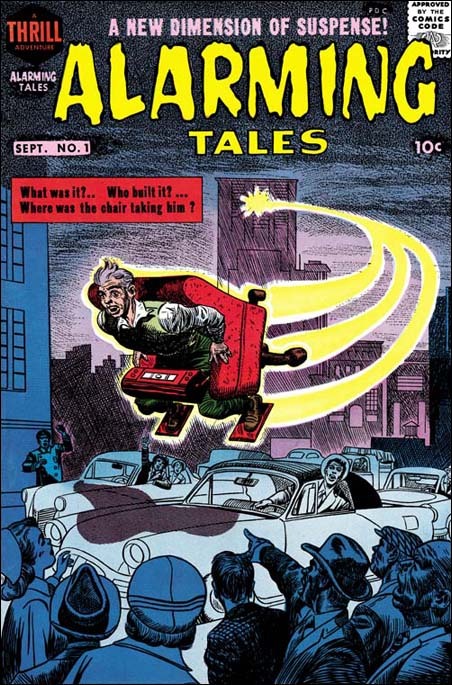 In fact the cover story for Alarming Tales #1 (“Donnegan’s Daffy Chair”) was originally intended to be used in Black Cat Mystic #59 (as shown by the original art for an used cover). Since both titles were bimonthly publications, it was unusual that they would have the same schedule. Normally such similar comics would alternate months (such as Simon and Kirby’s Young Romance and Young Love did). The original art for the unused cover of Black Cat Mystery #59 has a July cover date so perhaps the original intent was for alternating months but something delayed it. I had previously credit the cover art for AT #1 to Joe Simon alone but I now realize that the art is a “Frankenstein” made from different pieces of art. It was not that unusual for Joe to piece together different art (see Cover for Alarming Tales #2, My Third Attribution Attempt). 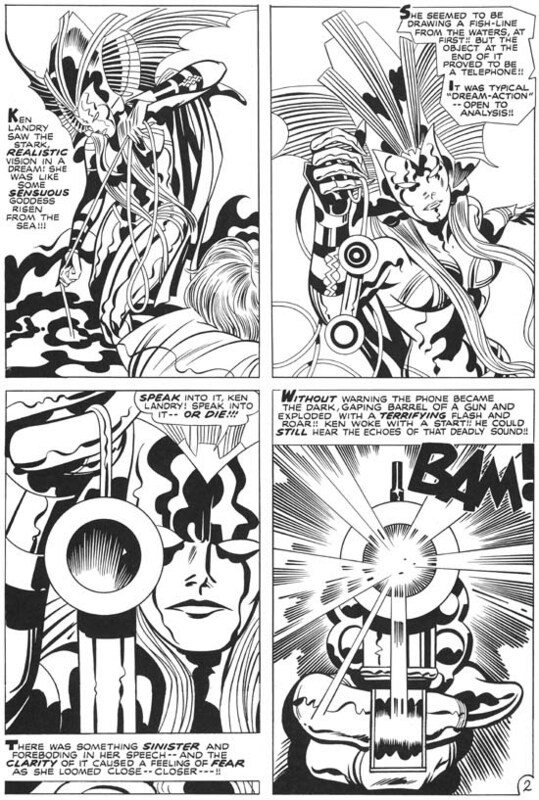 In this case that lower portion came from art that Jack Kirby drew while the upper portion was done by Simon. 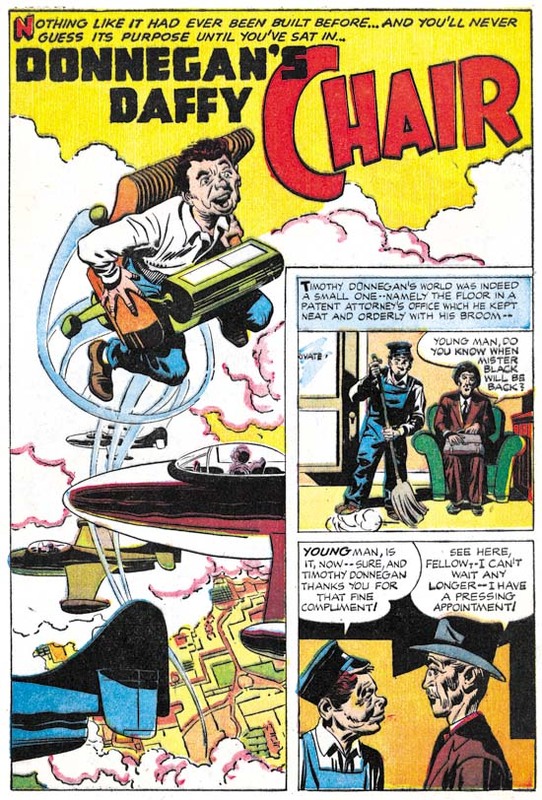 I suspect that the original art that Kirby made included a figure in a fly chair very much like the one in the actual story. That is the way that the unused cover for BCM #59 was done. That included goggles that covered the figure’s eyes. Such an depiction would fit the story but Joe probably felt (and I agree) that the cover would be more dramatic with the full face exposed. The portion of the art that Simon did was done on a craft tint board with irregularly shaped dots that sometimes is referred to as a mezzotint pattern. Lines were then “inked” over this with a pen to provide interesting dotted lines. It appears that except for the lettering the contents page was created entirely by stats from parts of the book. Simon and Kirby did not do use stats to create comic pages very often while they had their own studio but apparently Harvey either had a stat camera or used a service bureau to provide copies. I love the way the images of Donnegan’s chair are woven through the contents page. Scientifically engineered humans sounds like something out of more recent newspapers. 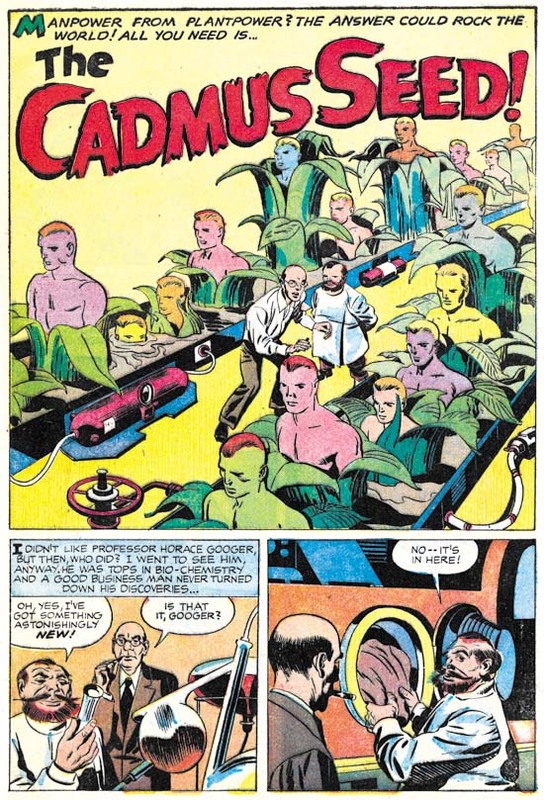 However the Simon and Kirby story never mentions DNA or cloning. The structure of DNA had been discovered by this time and it’s importance was well known in the scientific world. But science fiction had not yet caught up with science fact. Nonetheless “The Cadmus Seed” is a delightful story with a mildly humorous ending. “Logan’s Next Life” is the only story in AT #1 that could be describe as belonging to the horror genre. Since is consisted of only two pages it was not that much of a contribution to AT #1. Most of the stories from the Alarming Tales and it’s companion title Black Cat Mystic could best be described as science fiction. But despite being in the minority horror stories would still play a significant part of these titles. 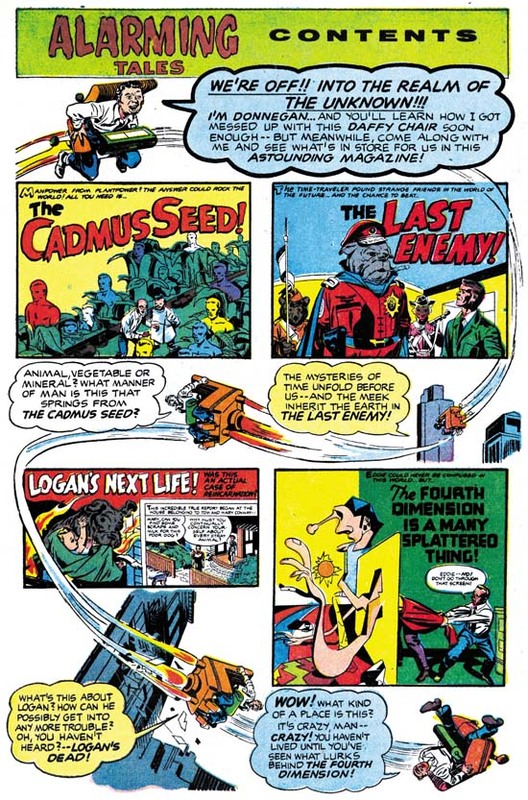 The art for “Logan’s Next Life” was based on an earlier story named “When I Live Again” that had appeared in Black Magic #13 (June 1952, see Little Shop of Horrors, Chapter 5). The original story was penciled and inked by Bill Draut. While Kirby was known to do an occasional swipe, such extensive swiping for a single story would be rare. 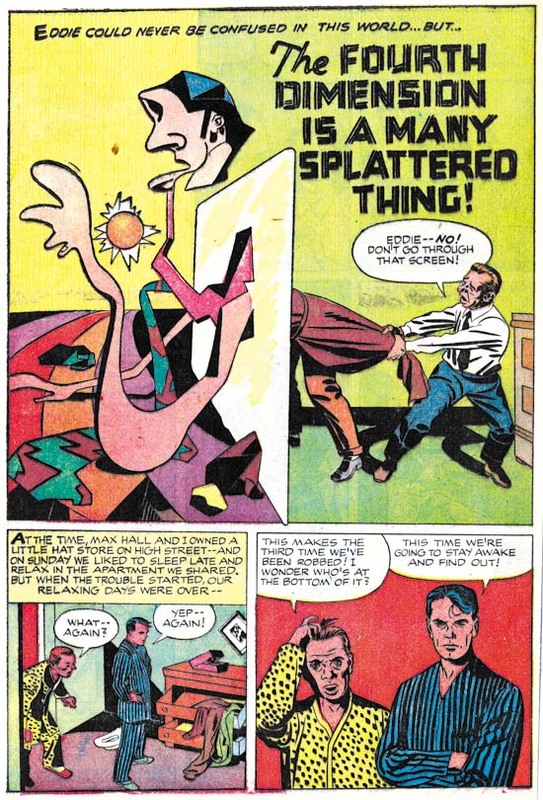 One example would be “Invisible Irving” from Fighting American #5 (December 1954, see A Simon and Kirby Swipe). Another example of an extensive Simon and Kirby swipe appears to be “Deadly Doolittle from Fighting American #6 (February 1955, see Fighting American, Jumping the Shark) but in that case it was Joe Simon doing the swiping. 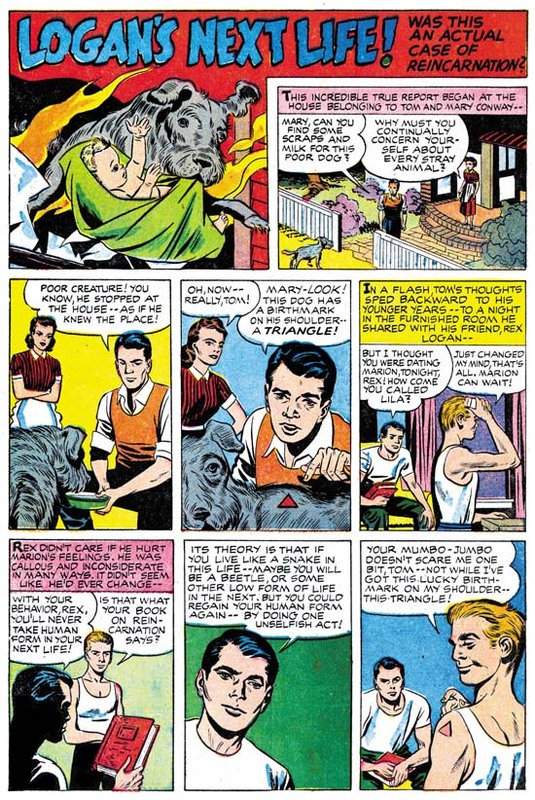 This story was included in a recent post concerning Kirby’s use of extra-dimensional traveling (Jack Kirby’s Trips to the Fourth Dimension). This story has longed been recognized as a prototype for Kamandi title that Kirby did for DC from 1972 until 1976. 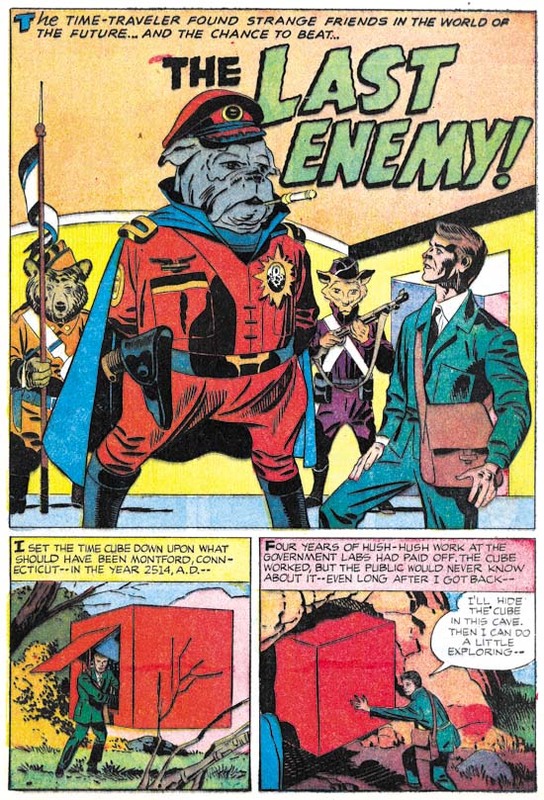 The most significant change is that while except for the protagonist, humans were completely absent from “The Last Enemy” they were present in Kamandi but usually as nothing more than speechless animals. But otherwise the theme of talking animals taking over the world was common to both. Frankly I do not recall how this change was explained in Kamandi, but in “The Last Enemy” it was the results of an atomic war. While that is a perfectly understandable explanation for the lack of humans it is not clear how the change in animals occurred. Oddly the story featured on the cover of AT #1 was the second shortest in the book. Stories from Black Cat Mystic and Alarming Tales were pretty consistently five pages long but “Donnegan’s Daffy Chair” was only four. I got a pleasant surprise when I visited my comic book store last night, DC’s reprint of Spirit World. What a marvelous time this is for Kirby fans as more and more of his work is being reprinted. Had someone told me a decade ago that DC would reprint Spirit World I would not have believed them, actually I would have thought they had lost their grip on reality. Spirit World was by no means a Kirby classic. It received remarkably poor distribution. Mark Evanier describes not being able to locate any copies at newsstands but finding bundles of them at a distributor’s warehouse that had never been delivered. DC’s confidence in it was so low that it was cancelled after a single issue, much too soon to be based on any sales figures. It is not even a cult classic, it rarely comes up in discussions about Jack Kirby’s art. But everything Jack did he did well so it is great to see this work back in print. Kirby wanted Spirit World to be a high quality magazine printed in color but that is not the way DC would publish it. Instead a wash was applied to the line art and the results were printed using a dark cyan ink. Frankly it was not the best approach. But that is the approach that was originally made and was repeated for the reprint. Although I wish DC had initially followed Kirby’s wishes I believe their decision for the reprint to reproduced the effect of the original publication was the correct one. The quality of the reproduction in the reprint is exceptional. There are times when the original magazine was a little clearer but others where the reprint did a better job of presenting the art. But these differences are minor variations unnoticeable unless the two are compared side by side. One important improvement made for the reprint was the paper. I have never been a fan of using a yellowish paper in an attempt to match the current look of comic books. That look is due to aging and was not the look the books had when they first appeared. Using a yellowish paper for the Spirit World reprint would have darkened the cyan inked and ruined the effect. Instead DC has wisely used a flat white paper for this reprint. 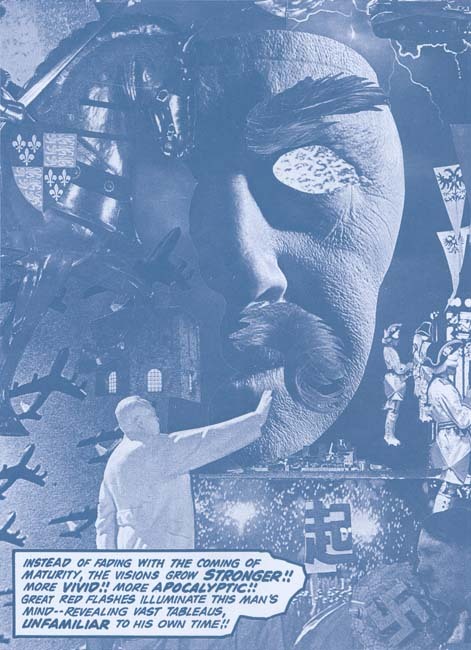 One of the special treats of Spirit World was all the collages that Kirby created for it. Kirby’s collages have been receiving more and more attention in recent years. 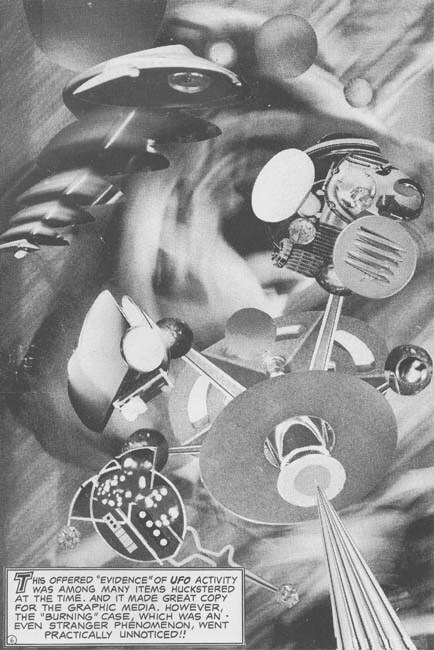 Recently Steven Brower has devoted an article on the subject (Jack Kirby’s Collages in Context). I must admit that as a young reader I was not overly impressed with Jack’s collages but as an adult I greatly admire them. Part of the problem with the collages was the rather poor printing they originally received. I could not resist using Photoshop to convert one of the Spirit World collage to a better quality black and white. In my opinion it is a distinct improvement. However remember that Kirby originally meant Spirit World to be printed in color and take a look at the original art of the same collage that is included in Brower’s article. What a difference and what a lost opportunity that DC did not follow Kirby’s wishes. Spirit World was cancelled after a single issue but Kirby had already completed the art for the second issue. 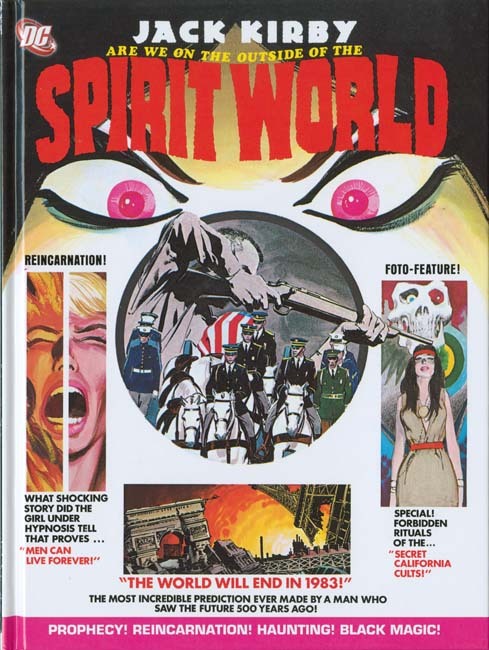 The Spirit World reprint includes the work that had been meant for Spirit World #2. I understand that these stories had been used in some of DC’s horror and mystery comics but the reprint only uses the line art. What a contrast between the two sections of the current book. While Spirit World #1 was inked by Vince Colletta and issue #2 by Mike Royer that is not the real reason for the difference in the appeal of the two sections. What is really shown is the rather detrimental affects of the wash and cyan ink had on the initial issue art. Kirby was at the top of his artistic form and it really shows in this last section. There is a small essay in this latest book by Mark Evanier. Evanier’s writings have appeared in a number of books on Jack Kirby (including Titan’s The Best of Simon and Kirby). With good reason as there probably is no one more knowledgeable on Kirby (if only he would finally publish his full biography on Jack). But what Evanier has to say is particularly important concerning the Spirit World as he was present and involved in its creation. Colleges played a small part in the second issue of Spirit World. But I could not resist including the sole exception. I hope to someday to discuss the Spirit World more fully, this has been more a review of the reprint book. I will not try to predict how successful the Spirit World reprint will be but I do believe it is a worthy addition to the collection of any Kirby fan.